Forklift safety has been a front-and-center topic in the warehousing and construction industries for years, yet injuries and even fatalities are still common. Forklifts or industrial trucks cause about 96,000 injuries each year in the United States alone, according to OSHA data. Of those, more than a third—about 34,900—are serious injuries, and 85 are fatalities. Earlier this summer, a worker died after being pinned against a wall by an out-of-control forklift in a supermarket—a workplace many would assume would be free from deadly hazards. Even if your workers are competent and well-trained on safety policies, you need to make sure they understand the specific hazards of forklift operation and what they can do to prevent accidents. 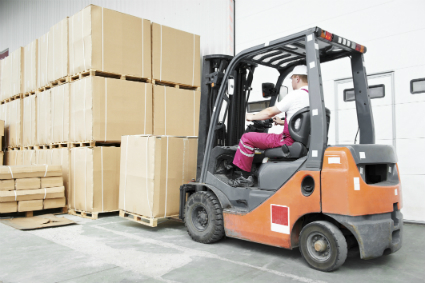 Here are five forklift safety guidelines every employer should follow. OSHA doesn't require forklift licensees or annual testing, but you should still regularly evaluate your employees through written tests and live skills demonstrations. This is particularly important if you've hired temporary workers, or if some of your most recent hires have completed different training programs with their previous employers. You may not need to retrain them, but the only way to be sure they understand safe operating procedures is to evaluate them according to your own strict guidelines. OSHA also requires operators to be trained according to all operating instructions, warnings and precautions listed in a vehicle's manual. That includes any restraints and other safety devices. Complying with this regulation will further reduce liability and keep your workers safe as they navigate slick terrain and work with uneven loads. In fact, any employees working around forklifts should be taught situational awareness and be required to use hardhats to avoid injuries if loads are dropped. Regulations and operating manuals cover general safety practices, but your training must also address hazards specific to your specific jobs and facilities. Every site and building has its own challenges for forklift operators—narrow ramps, poorly lit sections and hard-to-navigate aisles—and it's important to warn your employees of these hazards before they get to work. The same is true for unevenly distributed packages and palettes. While you may be able to control the palettes you put together, you'll likely still have to deal with uneven loads from distributors. Given the number of forklift accidents that still occur each year, it's a good bet you've suffered at least a few minor incidents at your own facilities. To prevent similar events in the future, keep track of all incidents in a single database. BasicSafe's Incident Reporting and Investigation Module allows you to track all incidents with standard and custom forms, issue orders for corrective action and automatically generate OSHA documentation with the data you've entered. These training measures are critical in complying with regulations and keeping your forklift operators safe, but manually tracking every employee's instruction can be a nightmare. Make things simpler for yourself and your trainers with BasicSafe's Safety Training Management Module, an easy-to-use tool for creating custom training sessions and tracking completion and evaluation.